Pluto and Charon, the largest of Pluto's five known moons, seen Jan. 25 and 27, 2015, through the telescopic Long-Range Reconnaissance Imager (LORRI) on NASA's New Horizons spacecraft. New Horizons was about 126 million miles (203 million kilometers) from Pluto when the frames to make the first image were taken; about 1.5 million miles (2.5 million kilometers) closer for the second set. These images are the first acquired during the spacecraft's 2015 approach to the Pluto system, which culminates with a close flyby of Pluto and its moons on July 14. 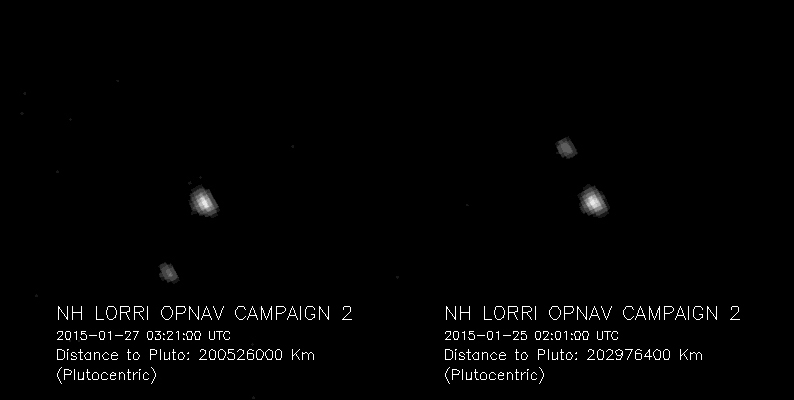 Pluto and Charon subtended 2 pixels and 1 pixel, respectively, in LORRI's field of view. The image was magnified four times to make Pluto and Charon more visible. The image exposure time was only a tenth of a second, which is too short to detect Pluto�s smaller moons.